Looking for Meeting Social Events? Visitors to the Los Angeles area find they can do and see anything imaginable in this incredibly diverse area. Los Angeles' top attractions, such as Disneyland or Universal Studios are already world famous, but typically require an entire day. Well, if you are going to visit LA, you really have no choice but to pay Hollywood Boulevard a visit. Situated in North Los Angeles, between Downtown and the Hollywood hills, the Boulevard plays host to the Hollywood Walk of Fame, where stars of the screen are commemorated by engraved stars built into the sidewalk. Not only will you see Los Angeles at its most lively but a number of other attractions are featured along the boulevard, including Grauman's Chinese Theatre, the Hollywood Wax Museum, the Kodak Theatre and, of course, a view of the Hollywood Sign (you can't actually get close to the sign itself - it is in a protected zone). There are dozens of bars and restaurants to rest and relax in on the way. So catch a cab and enjoy the stroll. The Getty Centre is in the Hollywood hills, near to the 405 freeway, and is the $1.2 billion flagship museum of J. Paul Getty, the oil magnate who died in 1976. The museum is free (but closed on Mondays) and looks across the whole of Los Angeles. Some remarkable architecture (by Richard Meier) contains a huge collection that covers classical sculpture and art, European paintings, drawings, manuscripts, sculpture and photographs. The Center also possesses some beautiful surrounding gardens. A stunning and relaxing place to visit. 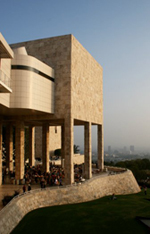 For more information, visit the Getty Centre's website at http://www.getty.edu/. Not just a stunning Californian beach but also the promenade parallel to it that takes in the world-famous Muscle Beach, tennis courts, beach volleyball courts, a bike trail and a long series of unique architectural beach-facing condos. Venice Beach (named after the canals built into the drained marshland behind it) is a beach resort built in the early 1900s that has become a tourist attraction and is renowned for its electic, counter-culture atmosphere. Its palm-tree promenade - littered with shops, bars and restaurants - follows the coast all the around to Santa Monica where it meets the pier - another famous LA landmark. A stroll you won't forget. You can see a webcam of the main Venice Beach entrance here. Los Angeles is famous for its wealth of extremely exclusive (and extremely expensive) fashion boutiques. Most famous of all the shopping roads in posh Beverly Hills is Rodeo Drive, a road that boasts just about every high-fashion label in the world. Giorgio Armani, Bang & Olufsen, Badgley Mischka, Bally, Bottega Veneta, Bvlgari, Cartier, Celine, Chanel, Christian Dior, David Yurman, DeBeers, Dolce & Gabbana, Escada, Gucci, Hermès, Lacoste, La Perla, Louis Vuitton, Polo Ralph Lauren, Prada, Roberto Cavalli, Tiffany & Co, Valentino, Versace and Yves Saint-Laurent are but a smattering of the shops. And if that weren't enough, the cheaper if hipper Melrose Avenue offers goods and clothing from a range of newer fashion houses including Marc Jacobs, Diane von Furstenberg, Miu Miu, Oscar de la Renta, Paul Smith, John Varvatos and others. If high-fashion isn't your thing, you'll still find plenty of places to shop in Beverley Hills, as well as downtown and Santa Monica. If you love shopping, you'll love LA. Marina del Rey is just up the coast from Los Angeles airport and is the largest man-made yacht harbour in the world. 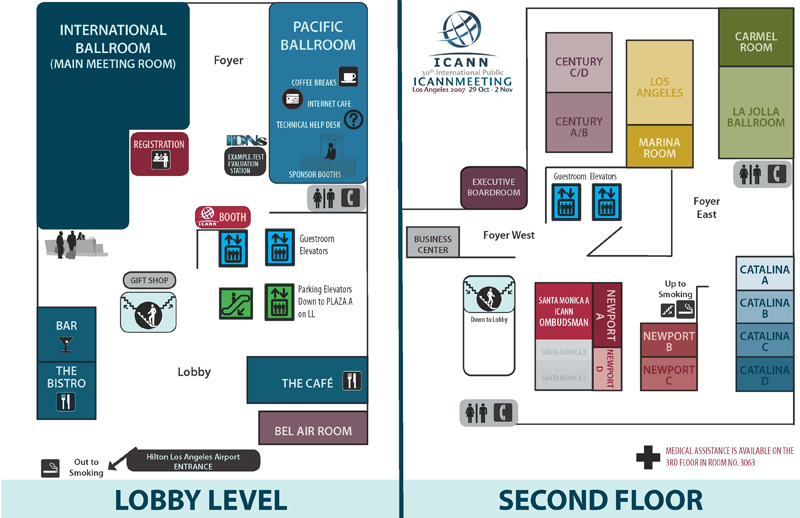 It is also the location of ICANN's (and the University of Southern California's Information Sciences Institute) headquarters. The marina itself is surrounded by high-rise condos, hotels, apartments, shops, and restaurants, some good, some not so good. Marina del Rey is, oddly enough, not actually part of Los Angeles despite being surrounded by the city. There would be little point visiting ICANN while the conference is on, but it is worth visiting for nothing else to see the sunset over the harbour, especially if you have a seat in one of the restaurants that overlook the yachts and pleasure boats. The restaurants, shops and shoreline of Manhattan Beach are just a short bus ride away, thanks to the Ocean Express shuttle. This free service operates hourly from 10 a.m. to 10:30 p.m and provides complimentary transportation to and from the Century Corridor to the shops and attractions at Manhattan Beach. Hop aboard! Marina del Rey, Santa Monica, and Westwood are all easily accessible from the Hilton Los Angeles Airport. Guests can catch the bus right in front of the hotel. The fare is $.75.